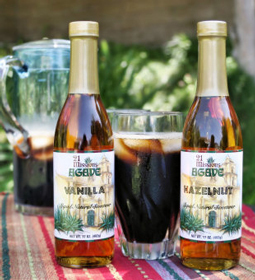 21 Missions Agave Hazelnut Iced Coffee - A recipe from Savor California, the online showcase for extraordinary gourmet foods and beverages from California. Brew coffee at double strength, using 1 cup ground coffee to 3 cups water. After brewing is complete, add the 21 Missions Agave Hazelnut Syrup (add more or less Agave syrup to taste and desired level of sweetness). Add 3 cups ice to the pitcher of coffee and let cool. Serve in a tall glass filled halfway with ice. Adjust the coffee's strength by adding water to taste.